Medoz Cleopatrah - Northwest Bengal Cats Beautiful, friendly Bengal Cats and kittens for sale in the Pacific Northwest of Oregon. 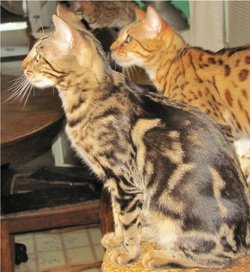 Cleo is a big beautifully solid girl with a wonderful pattern, great type and she produces gorgeous Bengals. Some of our future Breeders are her sons and daughters: Charybdis Flame On, Charybdis LeeLee and Charybdis Ahsoka Tano. Cleo is PK-Def N/N and was screened HCM Normal by Dr. Kathryn Atkinson of Cardiology Northwest in Portland, OR on June 14, 2013.